To promote International Volunteers Day on 5th December Milton Keynes and District Branch would like to celebrate this by offering FREE NEUTERING VOUCHERS between 6th and 8th December 2018. 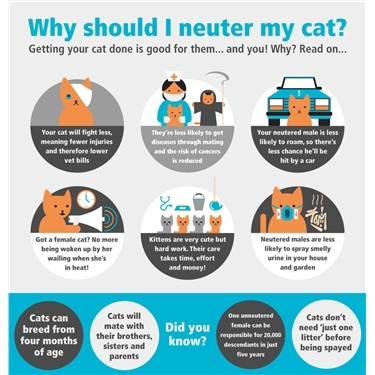 Take a look at the infographic for the benefits of neutering your cat. Vouchers will be issued within a week and sent directly to the vets of your choice then you will need to call your vet to arrange the appointment. The same terms and conditions as previous campaigns and, in addition, we are unable to issue vouchers for cats adopted from another charity or group as they will be your first contact regarding neutering. This Branch covers postcodes MK1 to MK19 and MK46. If you are outside these areas, please contact your local branch.